I have included charts of this ETF, GDX, in the last couple of gold posts and thought I should make a separate post on it for completeness sake. 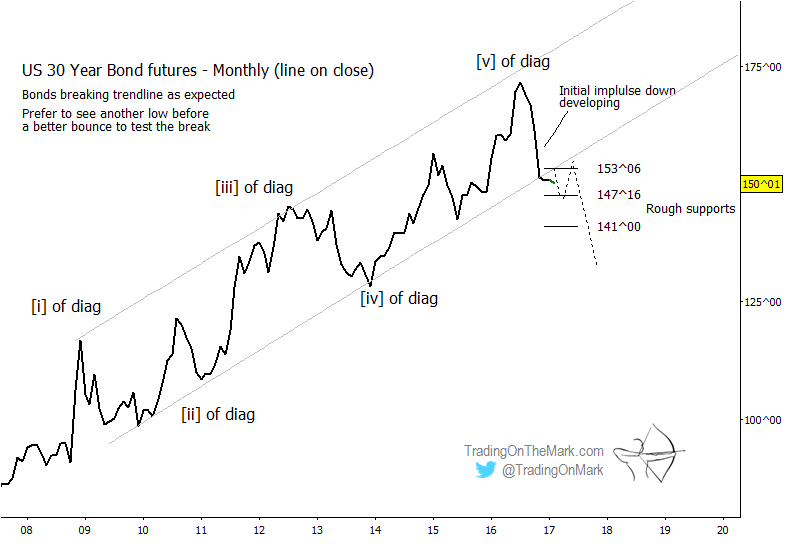 The main hypothesis shown on the following monthly and weekly charts is pretty similar to that of gold except that I am assuming an ending diagonal here as opposed to a simple impulse lower essentially allowing for a couple retests of the of the early 2016 low before a climb out of the hole. The wave count that I last had on the big picture in gold just didn't sit well with me and have put some thought into it over the weekend. The overall main and alternate ideas in general are the same, it is more of just a technical wave counting issue. I have been putting off a bigger picture gold post as I have been reevaluating the big picture EW counts. Let me start with the two scenarios I had been using and move on from there.